We’d love your help. 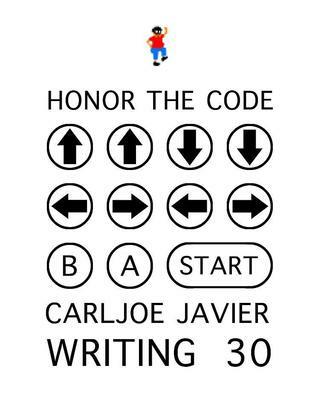 Let us know what’s wrong with this preview of Writing 30 by Carljoe Javier. “In his first essay, Carl states the intent of the book, ‘to capture what I believe in at the moment, and reflect the concerns and ideas that I am trying to deal with, work through, and reconcile at this point in my life.’ With an overabundance of creative surplus, he poured himself into the work. As with some of his other work, Carl gave himself a constraint. Since the bo “In his first essay, Carl states the intent of the book, ‘to capture what I believe in at the moment, and reflect the concerns and ideas that I am trying to deal with, work through, and reconcile at this point in my life.’ With an overabundance of creative surplus, he poured himself into the work. As with some of his other work, Carl gave himself a constraint. Since the book would be called Writing 30 and would be reflections of one who was turning thirty, why not write it all in thirty days? And so he did. To ask other readers questions about Writing 30, please sign up.